BLOOMINGTON, Ind. -- Starting today (Oct. 13), students, researchers and the general public will have free access to scholarship that documents people's everyday lives in communities around the world, in cities as disparate as Bloomington, Indiana, and Banaras, India. The Open Folklore portal web site, www.openfolklore.org, launched today during the 2010 American Folklore Society meetings in Nashville, Tennessee. The project is a joint effort between the American Folklore Society and the Indiana University Bloomington Libraries, in cooperation with the IU Digital Library Program. The new portal is part of the broader Open Folklore project and reflects changes in the ways scholars communicate their work in the digital age, both to fellow researchers and to various interested publics. The goal of the project is to make available a greater number and variety of useful resources, both published and unpublished, for the field of folklore studies and for the many communities with which folklore scholars partner. The initial version of the Open Folklore portal facilitates access to the HathiTrust Shared Digital Library, an online resource with more than 6 million books and journals from large research libraries. HathiTrust includes 57,000 books and journals comprising the IU Library's Folklore Collection, the most significant collection of its kind in the world. Beyond HathiTrust, the Open Folklore portal connects users with additional free books being made available by Trickster Press and other scholarly organizations, as well as by Utah State University Press, a leader in folklore studies publishing. USU Libraries, including the USU Press and USU Special Collections and Archives, have joined the Open Folklore project as its first strategic partner. The Open Folklore portal offers users integrated search of, as well as access to, a growing range of open access journals in folklore studies, including Indian Folklife, Folklore Forum, New Directions in Folklore, Museum Anthropology Review and the Indian Folklore Research Journal. The project has also worked with copyright holders to make an expanding number of important journals freely available to all through the HathiTrust Digital Library. Such titles include The Folklore Historian and Jewish Folklore and Ethnology Review. IU's participation in the Internet Archive's "Archive-It" service allows users of the Open Folklore portal to consult permanently archived versions of selected Web sites important for folklore studies. The first three of these to be included are those of the AFS, the Western Folklife Center and the Community Arts Network. 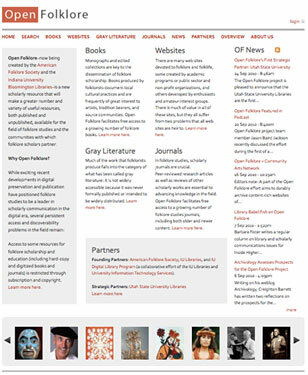 The Open Folklore site also provides free access to a range of other important scholarly materials, from course syllabi to public policy working papers. All of the content made discoverable and accessible through the Open Folklore site is freely available to users. Reflecting upon the implications of the effort for university libraries, IU Bloomington Libraries Associate Dean Julie Bobay stressed that direct collaboration between scholarly societies and university libraries is a new and very welcome development. "Universities, libraries and scholarly societies are all being asked to do more with less, but they are also being called upon to rethink older ways of doing the work of fostering, preserving, and circulating the products of scholarly research," Bobay said. "A re-visioning of the work ahead will certainly prove more fruitful if pursued in partnerships born out of a shared commitment to scholarly values." American Folklore Society President C. Kurt Dewhurst of Michigan State University said the current Open Folklore site is an early version of an ongoing effort that will multiply in utility and value in the coming months and years. "This AFS-IU Libraries partnership will help both of our institutions reach their goals: AFS's by improving access to all forms of communication and publication in the field of folklore studies, and the IU Libraries' by developing excellent collections and services critical for scholars now and in the future." For more information and updates on the Open Folklore project, see the Open Folklore Twitter and Facebook pages.